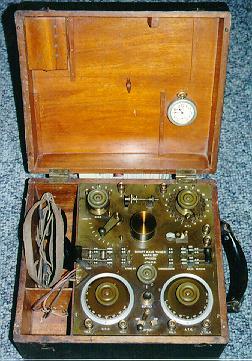 Early Wireless Radio Equipment using spark transmitters and crystal detector receivers allowed instantaneous communictions over great distances. This type of communication was especially important for communications with ships at sea which were otherwise out of touch with land for long periods. These web pages present photographs, descriptions, and reminiscences of the early days of wireless communication. Some excellent references and collector's guides are listed at the end of these exhibits. The exhibits cover the time from the beginnings of radio to the present. 10 Original Marconi Coherer:(22KB) This original Marconi Coherer is mounted on an ivory rod. 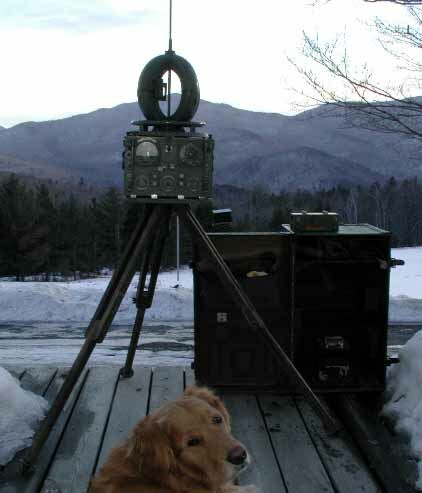 This early receiving apparatus was used to detect wireless telegraph signals. If you look closely, you can see the fat spark jumping between the contacts of the rotary spark gap in the background. A Typical Homemade Amateur Radio Spark Transmitter:(27KB)This is a typical homemade spark transmitter mounted on a piece of wood. The circuit is very simple but it works. 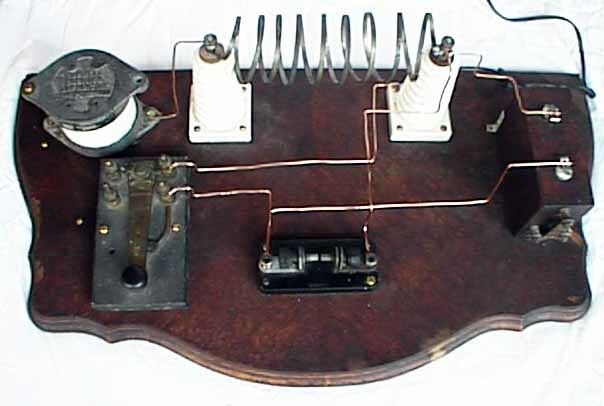 This receiver was built by a radio amateur and consists of a "cat's whisker" crystal detector and an extremely unusual vertical loose coupler coil set. Turning the knob on the right causes the center coil to go up and down, varying the coupling between the inner and outer coils. 270 CRYSTAL RADIO MADE OF TELEGRAPH KEY PARTS:(19KB) This crystal radio kit was sold with telegraph key shorting levers for all of the on-board conductors. The crystal is held in the hole in the end of one of the shorting levers with woods' metal which is like lead but has a lower melting point. If you leave it out in bright sunlight, it may melt. 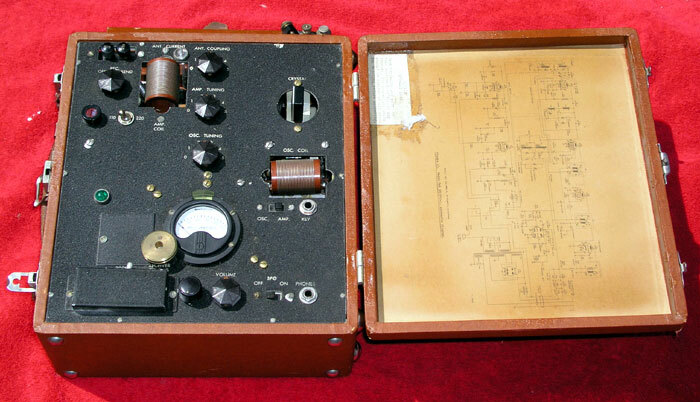 This British set is labeled: SHORT WAVE TUNER, MARK III, No. 4350, A.T.M.Co. Ltd. 1918. It has a pocket watch mounted inside the top lid. 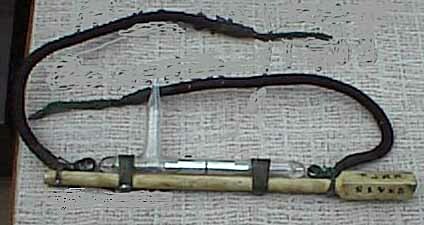 This is a rare and unusual U.S.Navy direction finding receiver. 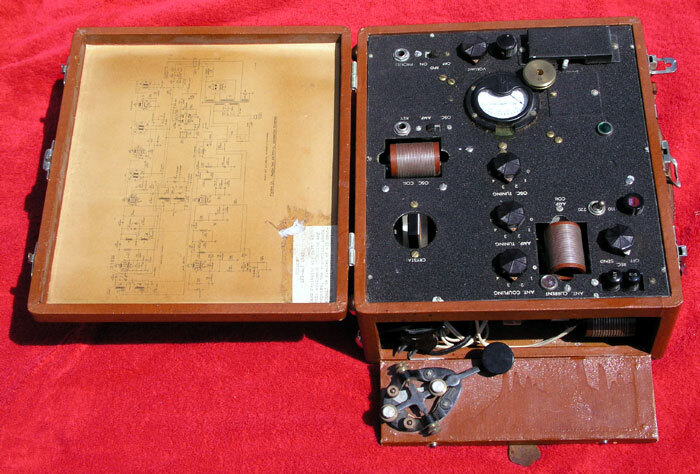 The label reads: RADIO RECEIVER, Type SE950. 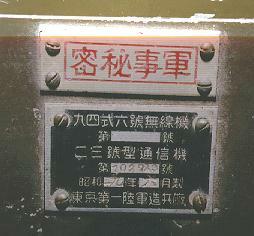 Serial Number 233N 300M to 3000M. Made for: Bureau of Steam Engineering by: National Electrical Supply Co. Washington, DC. Req No. 1279 NSA, Cont No. 35659. Date 3-26-18. The unit is amazingly clean and complete. 425 EARLY WW-I HORSE-CARRIED RADIO RECEIVER:(13KB) This interesting receiver was designed to be carried on a horse's back. The batteries go on one side of the horse and the receiver on the other. This replica of a 1920s transmitter was built by Ed White, W1NPL. It won first prize at the Antique Wireless Association Convention in 1995. 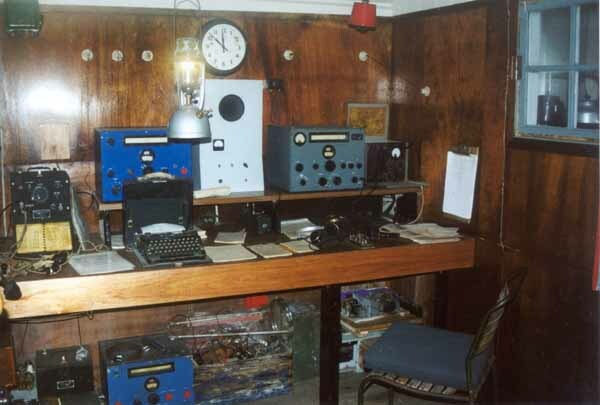 Many rare and unusual pieces of early radio equipment are visible in this photograph. 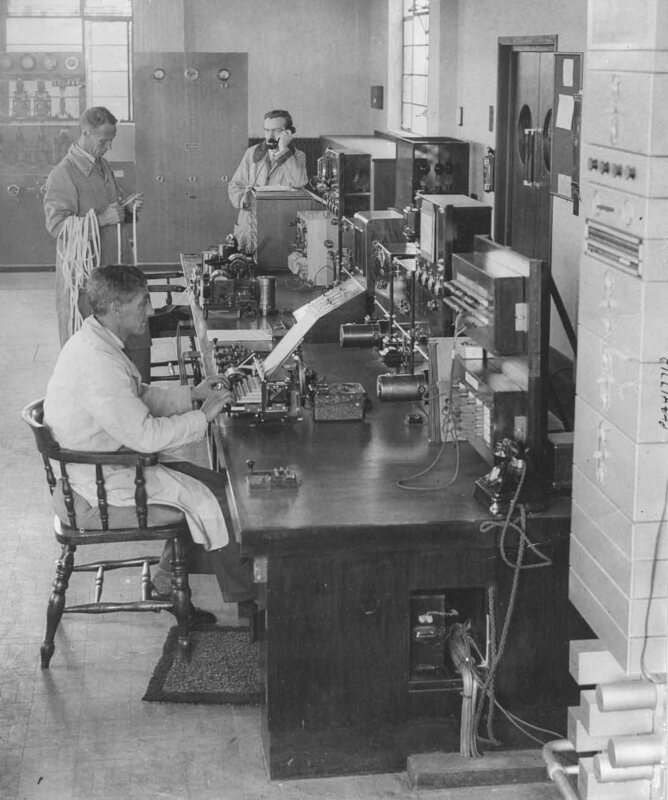 A Typical Early Desktop Radio Receiving Installation. Bob has had a long career in the radio field and he presents some of his experiences with early wireless apparatus. 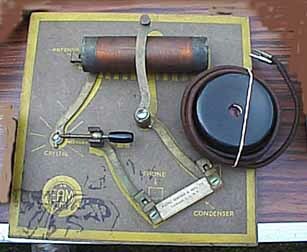 This was one of the more widely used German field transmitter-receivers. It worked in the VHF frequency range. This one-tube radio was brought back from the Philippine island of Mindanao by 24th Division Signal Corps officer Ed Shakalis, KD1BJ. The front cover:(17KB) and earphones are shown in this view. The label on the front cover:(14KB) reads "Top Secret". The circuit diagram and calibration charts:(18KB) are mounted inside the lid. The tube:(24KB) extends through the front panel. The inside view:(22KB)shows the tiny telegraph key. The key:(22KB)is shown in greater detail in this photo. Ed Shakalis reports that American Signal Corps Repairmen would often remove the mica condensers from the Japanese radios and use them in the American radios because the American radios came with paper covered condensers which did not last very long in the humid climate of the Philippines. 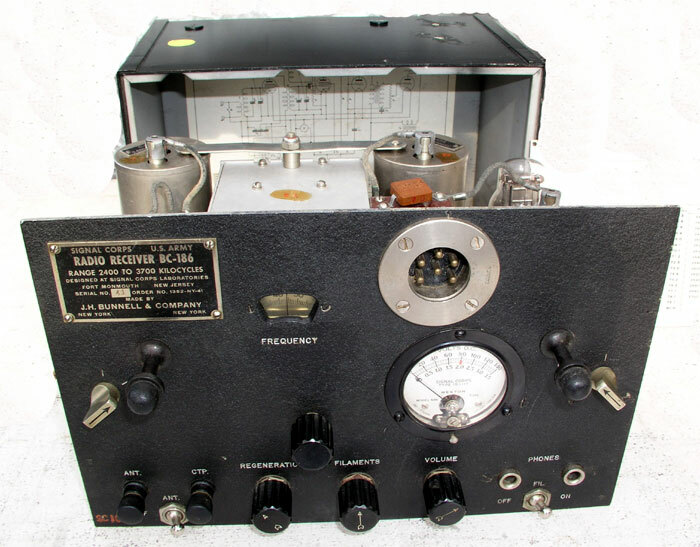 The Famous BC-973 Directon Finding Receiver:(23KB) This is the fascinating BC-973-B Direction Finding Receiver used throughout WW-2 for pinpointing the location of enemy transmitters. This set is unusually complete and includes the Receiver with loop and sense antennae, the tripod, the shipping case, cables, headsets, and the dynamotor. The Famous BC-611 Walkie Talkie with Rare Hand-Held Direction-Finding Loop Antenna:(23KB) This Walkie Talkie was the first hand-held radio set and it was used widely throughout WW-2. 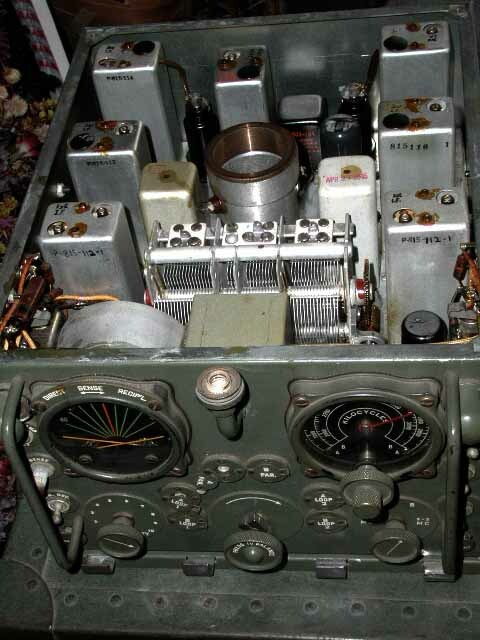 It transmitted and received in the 3.5-4.0 MHz range and was popular after the war with ham radio operators. 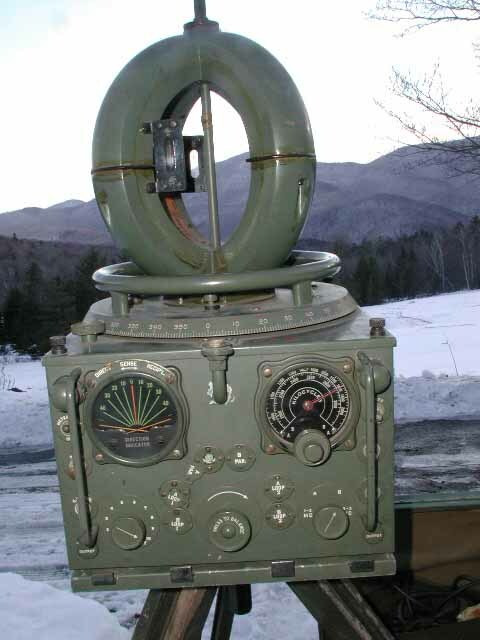 Unfortunately, the transmitters were reportedly purposely detuned to reduce the range and prevent the enemy from listening to the front-line communications. It required a special 103-Volt battery and, since they are hard to find, many people have wired 9-Volt batteries in series to obtain the required voltage. 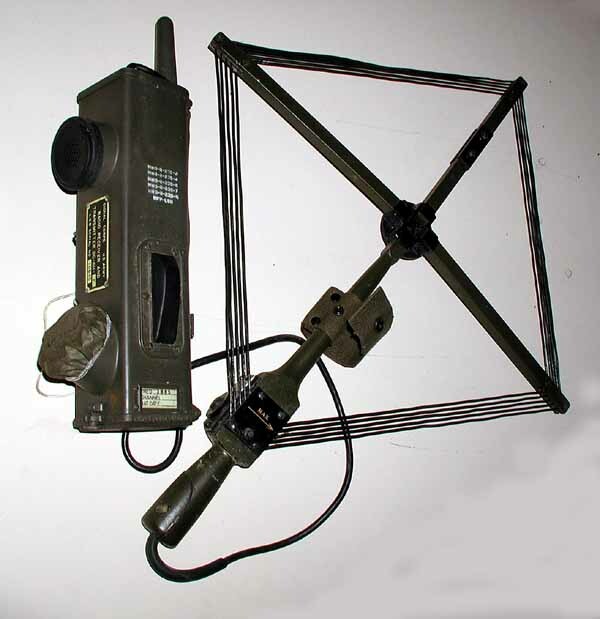 The hand held loop antenna allowed users of these sets to locate the direction of the transmitter by simply rotating the loop until the maximum signal was obtained. The Famous PRC-6 Walkie Talkies with two styles of rare Hand-Held Direction-Finding Loop Antennas:(23KB) This Walkie Talkie was widely used at the end of WW-2, in Korea, and throughout Europe. It transmitted and received in the 40-50 MHz range. 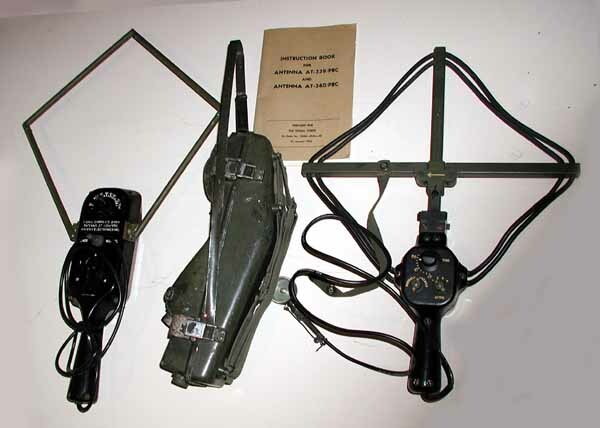 The hand held loop antennas allowed users of these sets to locate the direction of the transmitter by simply rotating the loop until the maximum signal was obtained. 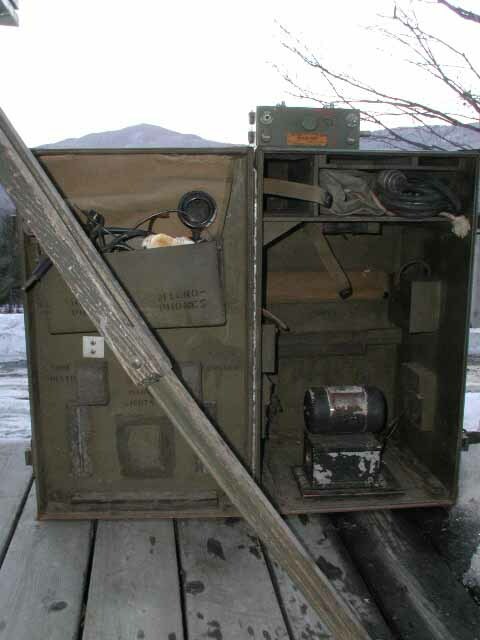 2900 The Famous American PRC-5 SPY RADIO TRANSCEIVER: This is the classic suitcase spy transmitter-receiver used during WW-2. 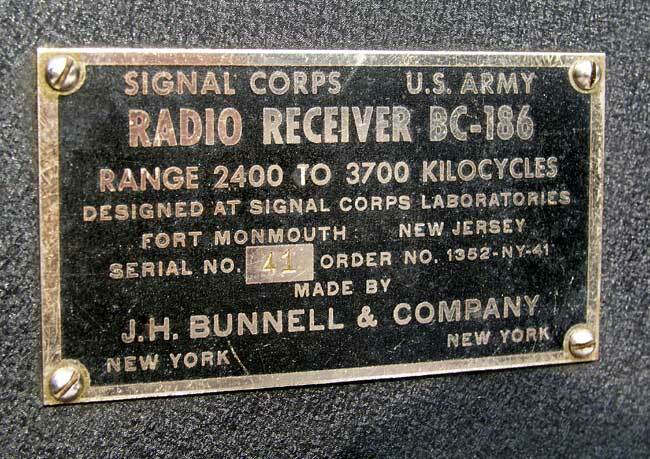 2905 Very Unusual BC-186 Receiver made by Telegraph Key Maker J. H. Bunnell. 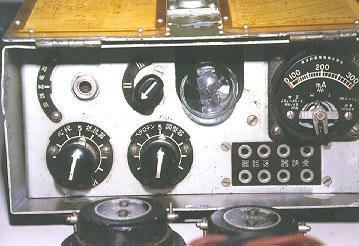 This is the only known example of a receiver made by Bunnell. The picture was sent to me by another collector. 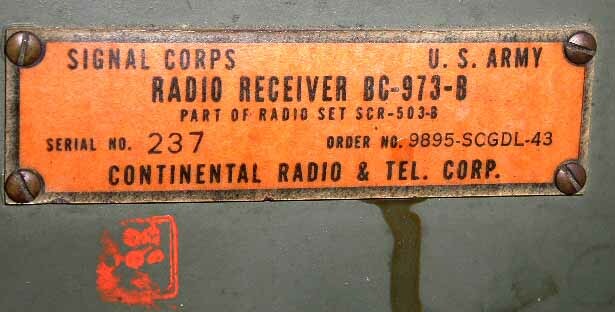 Receiver is Collins 75A2. Transmitter is Eldico 60 Watt (in background). Two meter transceiver is a Gonset Communicator I "Gooney-Box". This card was drawn by the widely known QSL artist, Otto Eppers, K2EA. Receiver is Collins 75A3. Transmitter is homemade 100 watt (in background). Keys are a J-38, a Vibroplex bug and a Mon-Key electronic keyer. Two meter transceiver is a Gonset Communicator I "Gooney-Box". 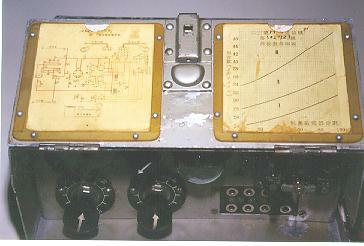 Receiver is Collins 75A3 with Panadapter and Oscilloscope. Transmitter is homemade 1000 watt 813 AM/CW amplifier driven by Lysco Transmitter with Meissner Signalshifter VFO. Keys are a Vibroplex bug and a Mon-Key electronic keyer. Two meter transceiver is a Gonset Communicator I "Gooney-Box". Receivers are Hallicrafters DD-1 Dual Diversity, Collins 75A3, and National NC-183 with panadapter and oscilloscope. Transmitters are Johnson Ranger driving a homemade 1000 watt p-p 813 AM/CW amplifier. Keys are a Vibroplex bug, Eldico electronic keyer and Mon-Key electronic keyer. Two meter transceiver is a Gonset Communicator I "Gooney-Box". 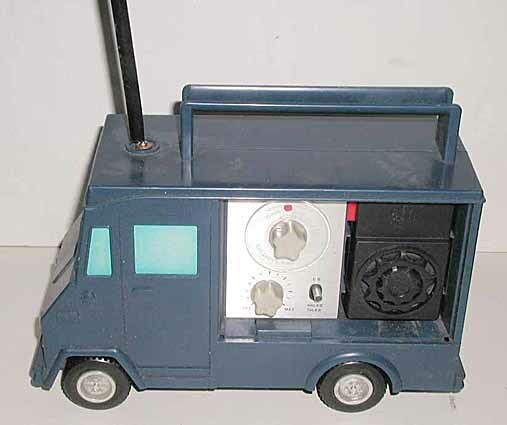 Transceiver is Collins KWM-2. Killowatt amplifier is Hallicrafters HT-33. 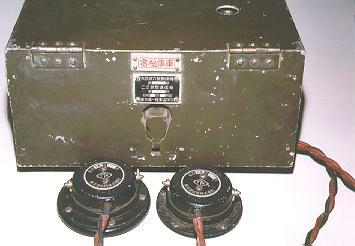 Two meter transceiver is Hallicrafters SR-34. Teletype is model 15. Also shown are Singer Panadapter and early gunpowder paper fax machine. Receiver is Drake R-4. 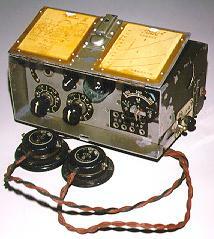 Transceiver is Collins KWM-2. Killowatt amplifier is National NCL-2000. Two meter transceiver is Hallicrafters SR-34. Teletype is military "Mite". Also shown is a Singer Panadapter. 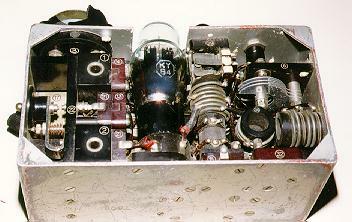 Receiver is Collins KWM-4 and Heathkit G-66. Transceiver is Gonset G-76. Transmitter is military surplus URT-3 and Johnson Viking Pacemaker. Teletype is model 15. Also shown is a Singer Panadapter. This photo was taken a few months before he became a silent key. This station remained untouched in an attic for 60 years and it was like a time capsule. When I entered the room there were partially filled-out QSL cards and construction projects on all surfaces. Note the dust layer. The station has been completely dismantled and sold. This extremely detailed original photograph shows many details of the station but it is a VERY large file ! 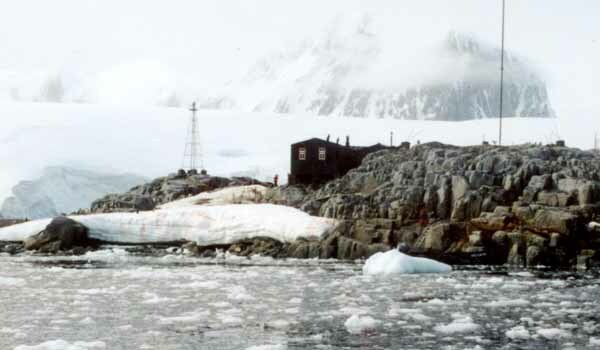 and may take a long time to download..sorry..
5050 BRITISH WW-2 MILITARY RADIO STATION 'A' for 'ALPHA' IN ANTARCTICA, VISITED BY W1TP IN 2002:(28KB) This lonely outpost was used by the British as part of secret operation TABARIN. It was tasked with monitoring German shipping traffic and measuring the height of the ionosphere. Measurements were made by transmitting pulses up into the ionosphere and measuring on an oscilloscope tube the time it took for the pulse echoes to return to the station. The special transmitter-receiver was later used in the discovery and tracking of the hole in the ozone layer over the antarctic. I visited the station in February of 2002 and took these pictures. These are the three identification labels which were attached to the huge 120KW RCA transmitter at Rocky Point. 5100 LONDON POLICE DEPARTMENT RADIO / TELEGRAPH ROOM:(89KB)This file has been left large (89KB) to allow you to see all of the details of the transmitters and telegraph equipment. 5125 EARLY DIVER-CARRIED UNDERWATER RADIO BROADCAST STATION:(17KB)This diver's backpack contains a radio broadcast transmitter. 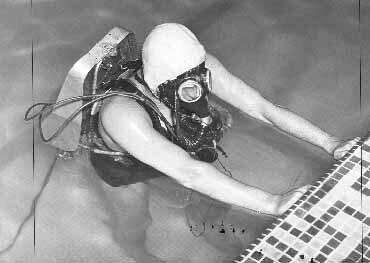 The diver wears a full face mask which allows the microphone to pick up his voice as he swims underwater. 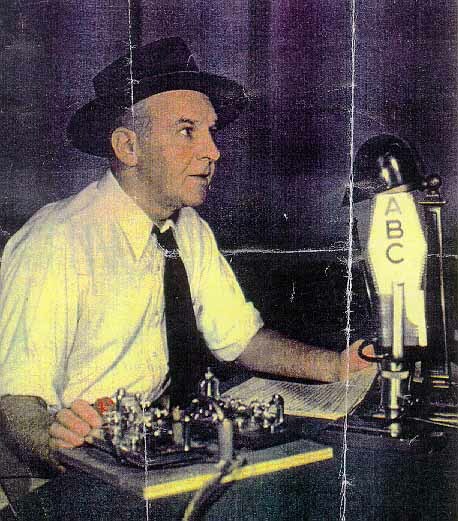 This newspaper photograph shows Walter Winchell using an RCA Model 44 microphone and two telegraph keys during his nightly broadcast. 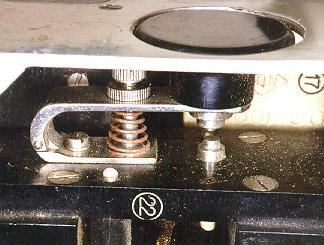 The two telegraph keys are a Vibroplex Lightning Deluxe and a Vibroplex Original Deluxe. 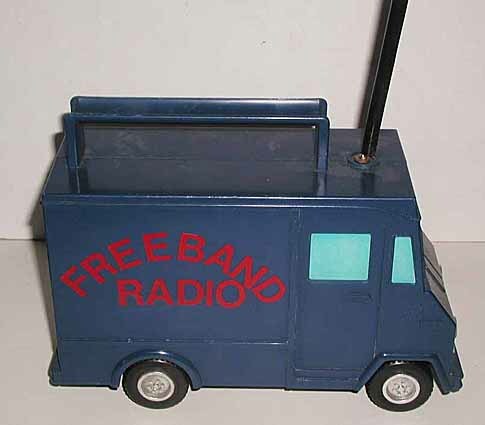 9000 * VERY UNUSUAL TOY FREEBAND RADIO TRUCK WITH WORKING CB-RADIO INSTALLED:(22KB)This is an interesting toy ''FREEBAND RADIO'' truck with a working Citizen's Band radio installed in the back. 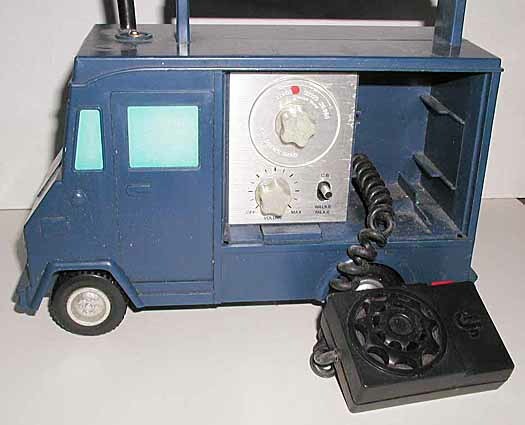 The radio has a tuneable receiver and a crystal-controlled transmitter. The microphone is removable. It operates on six D-size flashlight batteries which are installed in a compartment in the bottom. NOTE: Additional Radio equipment will be added as soon as possible. Poster, Harry. (1994). Poster's Radio & Television Price Guide. 1920-1990.